In November of 2012 there was a double shooting death of a Black couple in Cleveland, Ohio involving the Cleveland Police. 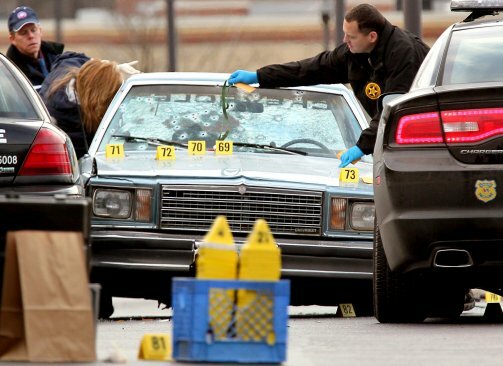 137 shots were fired at Timothy Russell and Malissa Williams. The shooting deaths took place after a 25 minute car chase that ended up on a dead end street. The couple was not armed. Thirteen officers unloaded 137 shots at the couple. 12 of the officers involved in this shooting were white and one was Hispanic. There were about 60 police vehicles were in pursuit of the couple during the 25 minute chase. There were up to 100 officers involved in this incident. The officers claimed that during the chase there were shots fired at them. However, the Ohio Bureau of Criminal Investigation's report revealed that the car Russell was driving had a bad muffler and it probably backfired while the vehicle was moving. No weapon was found in the car. No casings were found in the parking lot where the shooting took place or on the streets. When this story was initially reported I did not hear about it on any of the local media outlets in Columbus. I learned about this shooting incident from a connection that shared the story on a social media site. The incident did not receive a lot of media attention. I suspect that this is a story that none of the local media outlets wanted to give a lot of airplay to because it might cause folks statewide to get stirred up behind the behavior of the officers unloading a 137 rounds on two unarmed Black people. Up until Tuesday of this week, there has been no mention of the shooting deaths in the local media. A story was released today indicating that there would be some form of disciplinary action for the officers involved in this murder. The officers who were involved in the pursuit but not the shooting will be disciplined for violating police protocol. Nineteen of the 75 officers will be facing disciplinary action for offenses ranging from engaging in a pursuit without permission to providing false information on police reports. These officers might be temporarily suspended. No mention is made about any of the officers involved being brought up on charges of homicide. Nor is there any mention of officers being dismissed from the force for their actions. Timothy Russell was shot a total of 23 times. Malissa Williams was shot a total of 24 times. No weapon was found on the couple or in the car. 137 shots were fired at the car by the officers. This police department has a reputation for misconduct that is known within the Cleveland area. The Cleveland Plain Dealer conducted an investigation into the conduct of the Cleveland Police Department in 2011. The report focused on use of excessive non-deadly force by the Cleveland Police. It was noted in that report that the police chief often overlooked officers inconsistencies with police officers reports regarding those incidents. Chief McGrath demonstrated his tendency of not being fully aware of the inconsistencies in his officers reports or conduct during a press conference regarding the events of the shooting. In a press conference the following Monday after the shooting of Russell and Williams, Police Chief Michael McGrath said during a news conference that he did not believe that a supervisor had requested the pursuit be terminated. The police radio recordings made Chief McGrath's claim a moot point. The attitude that was displayed by Jeffery Follmer the President of the Cleveland Police Patrolmen's Association after the shooting sounded like a major effort to portray the victims as "bad" people to cover up the misconduct of the officers. Relatives of Williams on Monday demanded an apology from Cleveland Police Patrolmen’s Association President Jeffery Follmer, who referred to the deceased as "bad guys" and praised police for doing a "great job." Follmer claimed that his officers felt that their lives were in danger, even though no gun or casings were found from the gun that the victims allegedly had been firing at officers. Never mind that the officers involved ignored the termination order from supervisors. Russell and Williams did not stop trying to flee police and that made everything that occurred justifiable. Chief McGrath made the decision to call in federal investigators regarding this shooting. This move was not viewed as the right thing to do according to a lawyer for the Cleveland Police Union. Michael McGrath's attempt to reach out to federal authorities for help involving Thursday's fatal chase may place his department under intense scrutiny, which lawyers say could absolve it of wrongdoing or lead to changes in policies and procedures. But the lawyer for the Cleveland police union scoffed. He called McGrath's comments ill-advised, adding that they tainted the officers involved. Patrick D'Angelo had a reason to be in opposition regarding any outside investigation of police conduct by federal authorities. This would not be the first time that the Cleveland Police would be placed until scrutiny for their conduct within the community. The department has a back story of misconduct. In 2004, the Justice Department agreed to monitor the way Cleveland police officers used their weapons under an agreement reached with city officials. In that case, the city avoided a lawsuit from the Justice Department by revising the police department's policies governing the use of force by officers. For a year, federal authorities oversaw how the department complied with new policies. The changes followed a critical July 2002 letter from federal investigators who said some police shootings "may have been avoidable" and posed needless risks to officers and the public. Records show federal prosecutors have investigated the New Year's 2011 beating of Edward Henderson by four Cleveland police officers involving a criminal violation of Henderson's civil rights. Subpoenas were issued earlier this year, but it is unclear where the investigation stands. So, DeAngelo's protest regarding federal intervention is also a moot point because he knew that the police already had a reputation of questionable conduct and the tendency to violate people's civil rights. However, the mayor of East Cleveland has an entirely different perspective on what should happen to the officers who were involved in this shooting. Mayor Norton's opinion is more in line with my ideas about what should happen to the officers involved in this shooting incident. I will be keeping my eyes on this case to see what occurs. It definitely sounds like it is not over yet.